UPDATE: After this post was published and twenty minutes before he was scheduled to appear, Bill O'Reilly tweeted, "Breaking news on Hannity has delayed my appearance today. We’ll update you when that will be." According to a Hannity tweet, that "breaking news" is apparently related to Hannity's ongoing obsession with the Uranium One conspiracy theory. He added that O'Reilly will be back on "at a future date." Disgraced former Fox News host Bill O’Reilly will return to former colleague Sean Hannity’s radio show this afternoon. The interview is fresh evidence that neither Hannity nor Fox is particularly concerned with the ongoing reports that O’Reilly used his Fox position to prey on his female colleagues. If Hannity cared about his former colleagues’ reports of sexual harassment by O’Reilly, he wouldn’t be hosting him. If Fox’s executives cared, and were actually serious about fixing the network’s toxic culture and tearing down its infrastructure that enables sexual harassment, they would have stopped Hannity from giving O’Reilly a platform by now. This is the fifth joint appearance by Hannity and O’Reilly since Fox fired O’Reilly in April to quell the firestorm after The New York Times revealed that five women had been paid settlements after reporting workplace harassment by O’Reilly, who has denied all of their stories. After learning of that sixth settlement, Fox renewed O’Reilly’s contract with a hefty raise. The contract included provisions to protect the company if more women came forward to report O’Reilly had harassed them. While Hannity and O’Reilly hated each other at Fox, they appear to have bonded since O’Reilly’s ouster. O’Reilly appeared on Hannity’s radio show on October 5, September 26, and September 18, and made a September 26 appearance on Hannity’s Fox News program that the network heavily promoted. 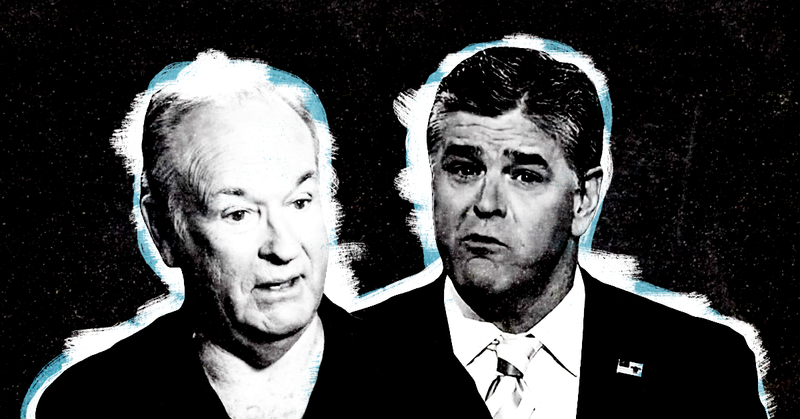 O’Reilly and Hannity have used the platforms to attack the women who reported that O’Reilly sexually harassed them, lash out at Media Matters and other critics, and promote O’Reilly’s book (O’Reilly later credited Hannity’s help for his book sales). I will join the @SeanHannity radio program today at 5:30p to discuss NYC terror attack. O’Reilly’s appearance comes hours after Sinclair Broadcast Group CEO Chris Ripley told Wall Street analysts that the company has no interest in hiring O’Reilly to host a show on its cable or syndication networks. Hannity’s ongoing collaboration with O’Reilly is a disaster for Fox, and there’s no sign it will end anytime soon. Advertisers are leaving Hannity's show and the network's revenue recently plummeted following a Media Matters education campaign focused on Hannity advertisers.